Priyanka Chopra and Nick Jonas’s new wedding photos surfaced on the internet to give us serious couple goals! Priyanka Chopra’s wedding was lavish, royal and quite dreamy. 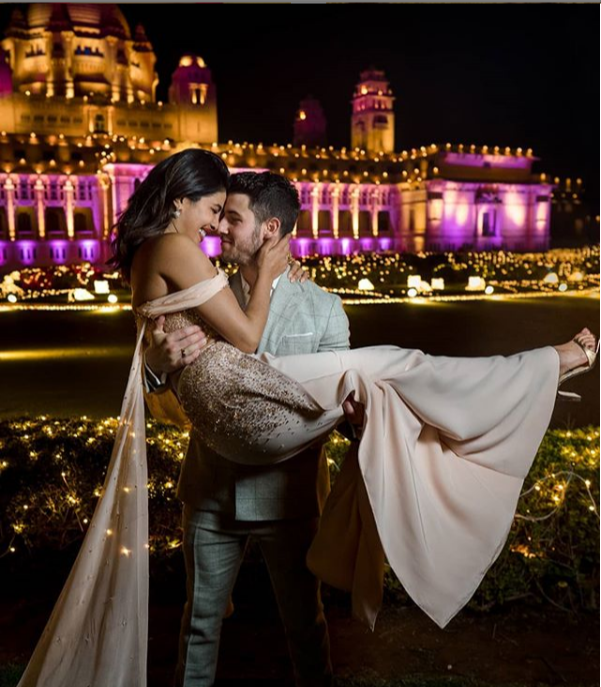 She tied the knot with Nick Jonas in Udaipur and the two look super beautiful and made for each other. The pictures of their wedding were all out but now, there are more coming your way. The makeup experts of Priyanka Chopra have posted their pictures with the bride and we can’t get our eyes off this brown beauty! Behind The Scenes of Nick Jonas and Priyanka Chopra’s dreamy wedding are nowhere for you to adore! The new image which is now surfacing the internet is Nick Jonas holding Priyanka Chopra and carrying in his arms. Well, what a beautiful picture it is with Umaid Bhawan in the backdrop. Well, we have no words. There is only love in this picture, which we can’t help but swoon over. They also celebrated with their family and friends at their Mumbai reception. Here are the pictures of the reception, which was hosted by Madhu Chopra.